WORLD SERIES: 1970, 1972, 1975, 1976, 1990. Along with Atlanta-Fulton County Stadium, this was probably one of the blandest of all the boring "doughnut" stadiums of the 1960s and 1970s. The field was artificial turf, and the outfield dimensions were perfectly symmetrical with no distinguishing features whatsoever. However, the baseball-to-football reconfiguration was done somewhat differently than others of its class: the left side of the lower deck was swiveled approximately 75 degrees into left field, while the right side stayed put. Thus, in similar fashion to RFK Stadium, the football gridiron lay at about a 15 degree angle from the right foul line, rather than straight from home plate to center field. The front row of seats was about five feet above the ground, ideally suited for football but not for baseball; that's why the "dugouts" were at ground level. The upper deck was larger than other stadiums in this class, and featured a wide lateral walkway to facilitate fan entry and exit. This resulted in a 7-8 foot vertical wall on the outer perimeter of the walkway, so it was not necessary to gouge out gaps in the seating rows to accommodate the entry portals as is typically done in upper decks; the upper-deck entry portals were beneath the seats, as indicated in the upper-deck diagram above. Another unique structural feature is that the stadium was built on top of the parking garage. The only big positive aspect to Riverfront Stadium was its scenic location on the banks of the Ohio River. You couldn't see that view from the inside, however, and a freeway separated it from downtown Cincinnati, so fans had to cross a pedestrian walkway. To prevent floodwaters from ruining everything -- as happened twice at old Crosley Field, the Reds' former home -- a huge retractable flood wall was built. Riverfront Stadium had its origins in the shady wheeling and dealing among city governments and sports promoters in the 1960s. The Reds knew they needed public funds to build a new stadium, but the only way to recoup the investment was to create a new pro football franchise so that the stadium would generate revenues through the autumn months. The promise of a big new stadium facilitated the creation of the Cincinnati Bengals in 1968, who played here from 1970 until 1999, after which they moved into their new home, Paul Brown Stadium, just to the west. Whereas Philip Lowry's Green Cathedrals indicates that it was 51 feet from home plate to the backstop until the final two years, when it was reduced to 41 feet, a newspaper account about the 2001 conversion of "Cinergy Field" (see below) gives 49 feet as the 2001-2002 distance, while confirming a reduction of ten feet. That implies that it had been 59 feet from 1970 through 2000, which nearly matches my estimate of 60 feet based on photographs. Even as plans were underway to replace it, in the latter months of 1996 the name of the stadium was changed to Cinergy Field, after the Cincinnati-area utility company. To make way for construction of the Reds' new home -- the "Great American Ball Park" -- demolition crews began tearing down the outfield portion of Cinergy Field in October 2000. (I caught a glimpse of a crane at the site as I drove by that same month.) The construction site was literally just beyond the outfield fence, and only a few feet separated the new stadium from the truncated portion of the old one. For the last two years of its existence, the outfield dimensions of Cinergy Field were reduced considerably: 325 feet to each foul pole and only 393 feet to center field, where a 40-foot high fence prevented too many easy home runs. Under this squeezed-in configuration, there was a distinct bend in the center field fence, rather than a broad circular arc as before. Also, real grass was planted, and the bullpens were moved from foul territory to behind the right field fence, but with fake turf. 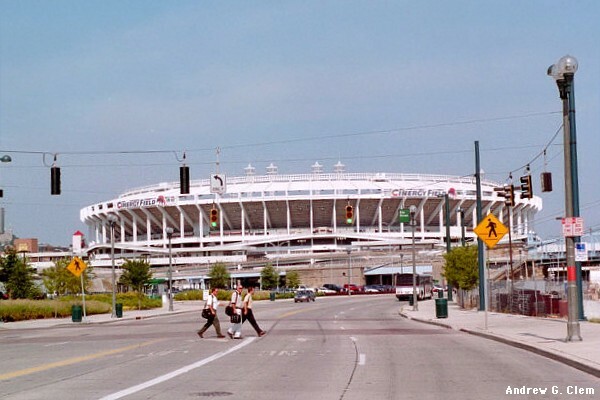 Riverfront Stadium was demolished in late December 2002. Spliced-together panorama from the Kentucky side of the Ohio River, showing, from left to right, Paul Brown Stadium, the truncated portion of the former Riverfront Stadium, and Great American Ball Park, then under construction. The three original color photos had sharply varying hues due to the angle of the sun, so I converted the panorama to black and white. Click on the camera icon ( ) links to see the photos, one by one. PHOTO #2 "Cinergy Field" and Great American Ball Park, the central portion of the Photo #3 panorama.